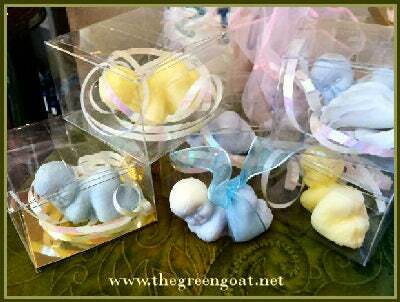 20 3D Snuggle Baby Goats Milk Soap Baby Shower favors for your special day. Made with Fresh Goats Milk, and oils of Olive, Coconut, Palm,Palm kernel, Castor See, and Shea Butter. Choose your Quantity, color/scent from drop down menu. Snuggle Baby is also available in Vegan Soap (using Aloe Vera Leaf Juice, in Place of Goats Milk) Snuggle Baby will have cross grain ribbon tied off on bum as seen in 1st picture and will come packaged in cello bag. see Shower Favor Listing for additional packaging available for Snuggle Baby. We ship via USPS Priority with in 4 Business days of paid order and during the summer months, we ship "cool pack" and do request someone to be home to receive your very special package. and if you would like us to ship to another address just convo me.